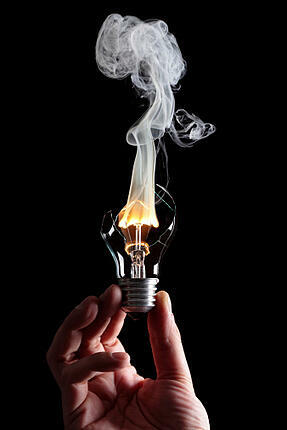 We preach electrical safety practices at Experts In Your Home and we know you practice them at home. But accidents, as they say, happen. In fact, there are nearly 50,000 electrical fires each year in the United States, according to the National Fire Protection Association. It's safe to say that not one of these fires occurs intentionally. That's why they're called “accidents” and not “intentionals.” And that's also why you must know how to put out an electrical fire if one happens to break out in your home. Take preemptive action with an appliance by unplugging it immediately and cutting the power at the electrical panel. Then call Experts In Your Home so that we can inspect and repair the situation promptly. If a small and contained fire breaks out – for example, if an extension cord begins to smolder -- you could successfully douse it with baking soda. That's right: baking soda, just like the kind you use in the kitchen. Baking soda contains sodium bicarbonate, which just happens to be the substance contained in Class C fire extinguishers, which are best suited for electrical fires. Baking soda produces water, which will effectively cool and smother a small fire. But speaking of water, it's imperative that you never, ever try to extinguish an electrical fire with water alone. Water conducts electricity and you could be badly shocked. So keep your cool, assess the source of the fire and fight what might be a natural impulse to reach for water. Instead, reach for that Class C fire extinguisher, which can effectively put out fires that originate around wiring, outlets, appliances and circuit breakers. Then turn off the power at the electrical panel to prevent the fire from growing. At this point, you also might wish to call 9-1-1- for assistance. With so many competing fears going on in your mind simultaneously, it's understandable if your rational thoughts become a bit jumbled. But at any point, you shouldn't hesitate to call for help, even if you think you can extinguish the fire yourself. Your local fire crew would prefer that you exercise the “better safe than sorry” rule to ensure your family's safety. Pull the pin located at the top of the level while you hold the extinguisher in an upright position. Aim the nozzle of the extinguisher directly at the fire. Try to identify the point of origin, if you can. Squeeze the level of the extinguisher. Sweep and cover the area with the extinguishing substance. You might have to move closer to the fire, but be careful. A little bit of distance is a good thing, and a fire extinguisher is capable of a longer trajectory than you might think. At this point, if the fire is growing beyond your control, evacuate your home immediately and call 9-1-1. Don't try to “play hero” and rescue even a beloved possession. Remember that things can always be replaced – and that fires spread with incredible speed and ferocity. Stay outdoors and wait for help to arrive. When things settle down, remember to contact an expert Chico electrician at Experts In Your Home to identify and repair the source of the electrical fire – and make your home a safe haven once again.